vided the original work is p roperly cited. pective are static, limiting in this way a possible improvement. R. DE LA VEGA ET AL. quently a higher risk to being obese (De, Small, & Baur, 2008). training programs (Lotan, Yalon-Chamovitz, & Weiss, 2009). 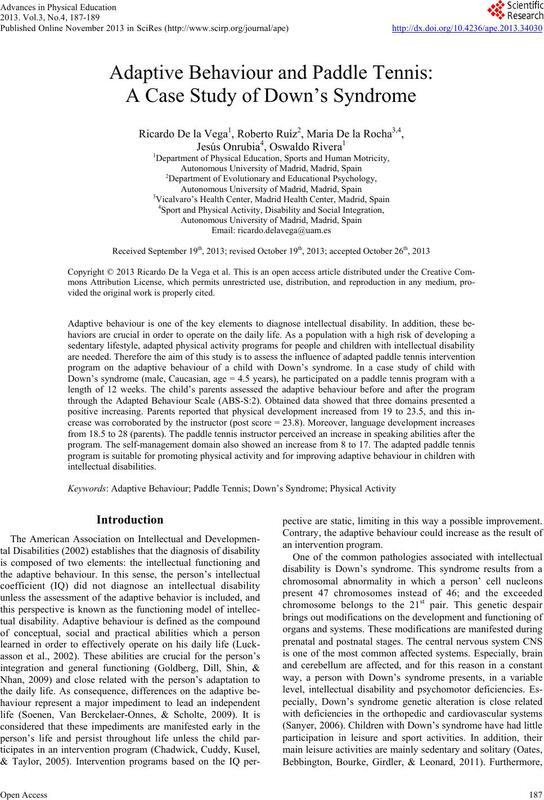 program on the adaptive behaviour of a child with DS. Behaviour Scale (ABS-S:2; Lambert, Nihira, & Leland, 1993). mestic activity, Self-direction, Responsibility, and Socialization. will not be used, neither in a further study. research staff in order to obtain information related to Carlos. with him before and after the program. ptive data of the ABS-S:2 domains are presented in Table 1.
cies are major ones, as in the case of Independent Functioning. to 28. This improvement was confirmed by the instructor. Note: aMean scores from parents’ assessment; *Maximun score per doma i n .
cies on these behaviors (Goldberg, Dill, Shin, & Nhan, 2009). scores, and this domain can be considered as a child’ strength. as an interactive space for leisure. dos (ASPADO), Universidad Autónoma de Madrid (UAM). 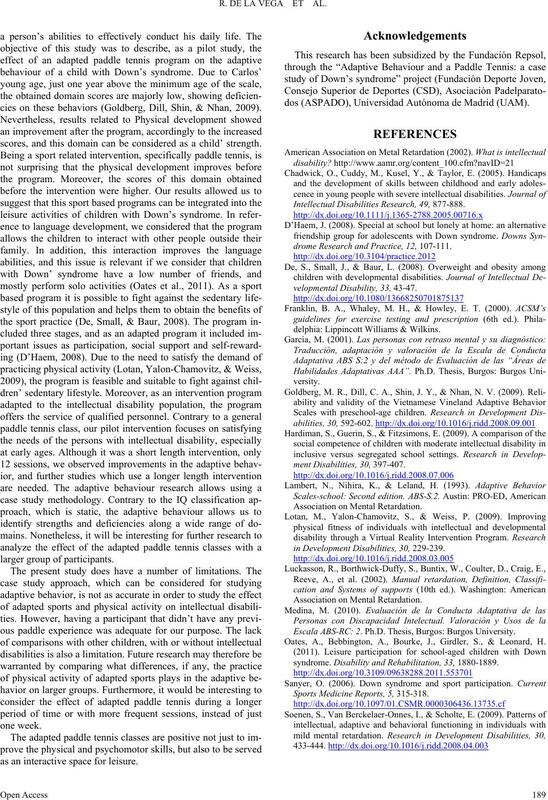 Intellectual Disabilities Research, 49, 877-888.
drome Research and Practice, 12, 107-111.
delphia: Lippincott Will iam s & Wilkins. in Development Disabilities, 30, 229-239. Escala ABS-RC: 2. 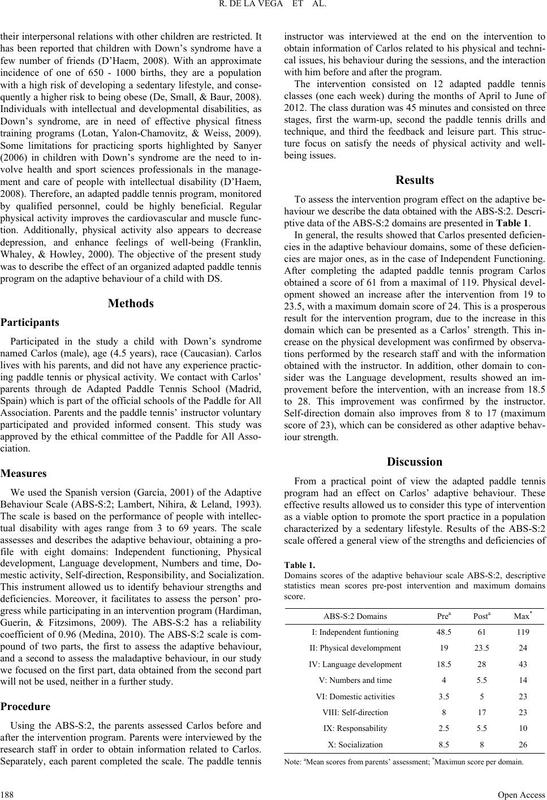 Ph.D. Thesis, Burgos: Burgos University. Oates, A., Bebbington, A., Bourke, J., Girdler, S., & Leonard, H.
syndrome. Disability and Rehabilitation, 33, 1880-1889. Sports Medicine Reports, 5, 315-318.